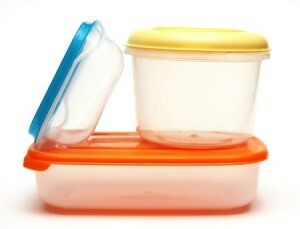 Storing some foods and beverages in plastic can leave your containers discolored. This guide is about removing stains from plastic food containers. How can I get red enchilada sauce stains out of plastic containers? I agree with the Plastic Booster. It comes in a tube like hand lotion, look for it with the dishwasher detergents. You add it with your regular detergent. I was skeptical when I first tried it but it really works! You can also set them out in the sunshine if you live where the weather is nice. No need to buy special cleaning products. Soak stained plastic containers in warm soapy water with a little bleach added. I have luck putting the stained plastic containers out in the bright sun. They come out like new. This truly is a very frugal procedure. I hope it works for you. I just wash mine well and ignore the tint, then when I use them for something else the pink has faded and then it's gone. Mostly for containers I use pint wide-mouth canning jars, they last forever, they're see-thru, easy to wash and no staining at all. I use automatic dishwashing powder. You can get this at any Dollar General or Walmart Store. You don't need to buy the expensive brands. Just pour a little in your container, fill it with hot water and let it soak. Stains come right off. Next choice is to wash well and then only use the stained containers for staining food items. Any advice on getting tea stains out of a Rubbermaid juice container? Bleach. Fill the container with warm soapy water and add a tablespoon or so of bleach. Let sit for a while and rub with a sponge. Repeat using more bleach if the stain remains. My Mother used to put any stained plastic containers out in the sun, or on a really sunny windowsill. It may take a few days, but it usually got out stains and odors. If it's tea, make a paste from water and baking soda, apply, and scrub with an old toothbrush. You may have to let it set a while before scrubbimg. After rinsing, most of the tea stain should be gone. Fill it with water and one half cup bleach. Let set for 15 min. Then rinse with vinegar water. What can I use to get spaghetti stains out of my plastic food containers? Removing I am not sure about but preventing I can help with. Spray the inside of the dish with non-stick cooking spray before putting the ingredients in it. Works like a charm every time.